This spring took forever, it seemed, to warm up, but it did, and just in time. Rains provided a boost to plants that suffered during the drought of last year, and dogwoods, crabapples, azaleas and rhododendrons had fabulous flowers this spring. But now June is here, and yesterday marked the first day of summer, and so we move on to the warmer weather and all it brings with it. 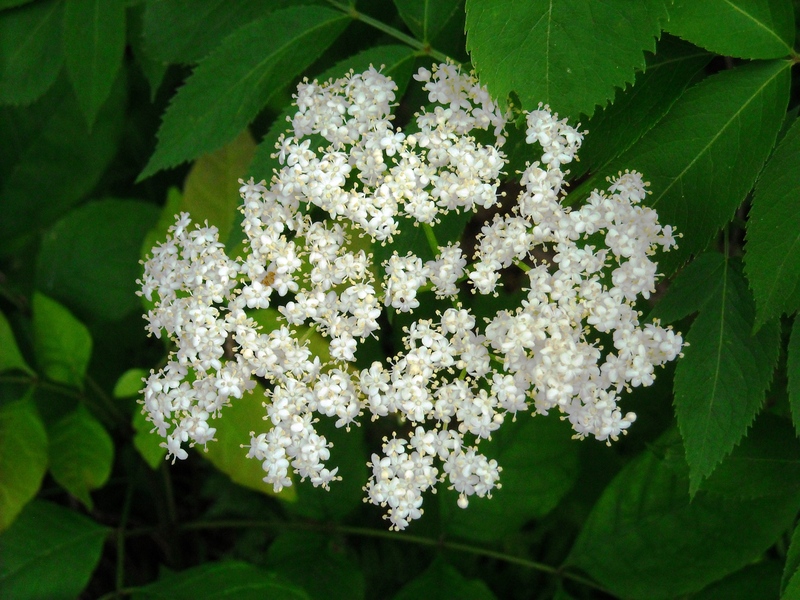 Native elderberries are in full bloom right now and many bushes are covered with the large, white flower clusters. Later on, the dark purple fruits will provide food for many birds and mammals. While edible for humans, and high in vitamin C, most people do not care for the raw fruits, but may make jam or pies from them. And mountain laurels are still in bloom now as well. Some cultivars, such as ‘Kaleidoscope and ‘ Firecracker’ have striking red flowers. Dewberry, a native berry that forms mats sometimes as it creeps along the ground, is in bloom now, and its flowers are important food sources for many native bees and butterflies. Soon to come into flower are the native Canada lily, Indian pipe and native wood lilies. 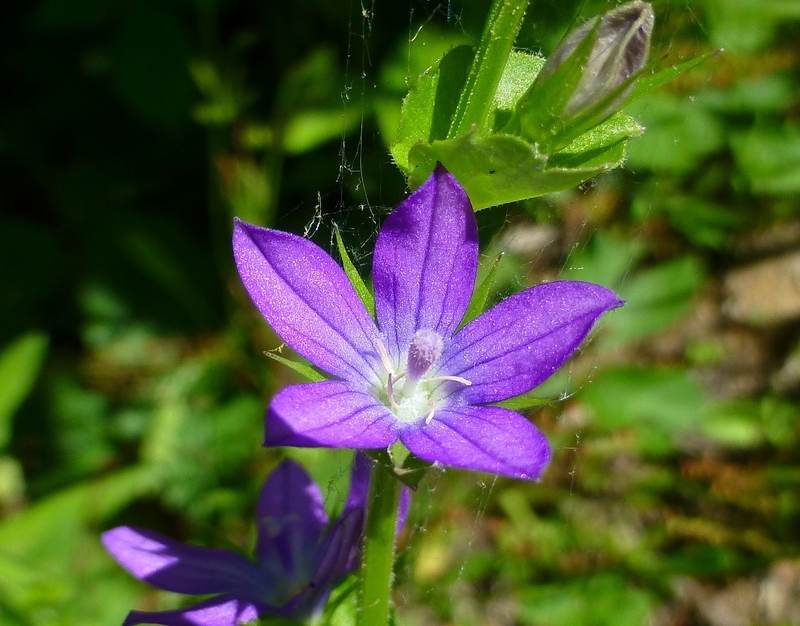 Venus’ Looking- glass, Triodanis perfoliata, is a native purple wildflower that has its flowers along the stem at the leaf axils. Poke milkweed, Asclepias exaltata, should be blooming now. 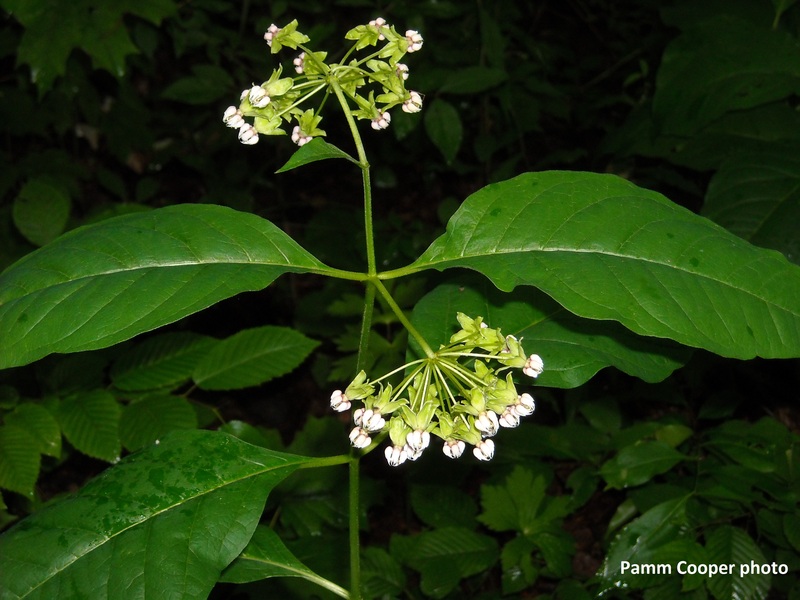 This native milkweed grows well in wooded, shady areas. Flower heads dangle down, unlike those of most milkweeds. The white flowers are attractive to several moth pollinators. Several insect pests are making their presence known. The infamous 4-lined plant bug, a lime green adult with 4 black lines down its back, leaves behind diagnostic feeding damage that later on will look like black angular leaf spots. They are cosmopolitan in plants they will eat. This year they have been reported feeding on many herbs, dandelions (who cares?! ), sunflowers, sedum, and the list goes on. Also, both the Colorado and false potato beetles are mating as we speak, and they seem to be heading for a banner year, population –wise. So crush the eggs as you may find them on any of your nightshade family plants like tomatoes and peppers. 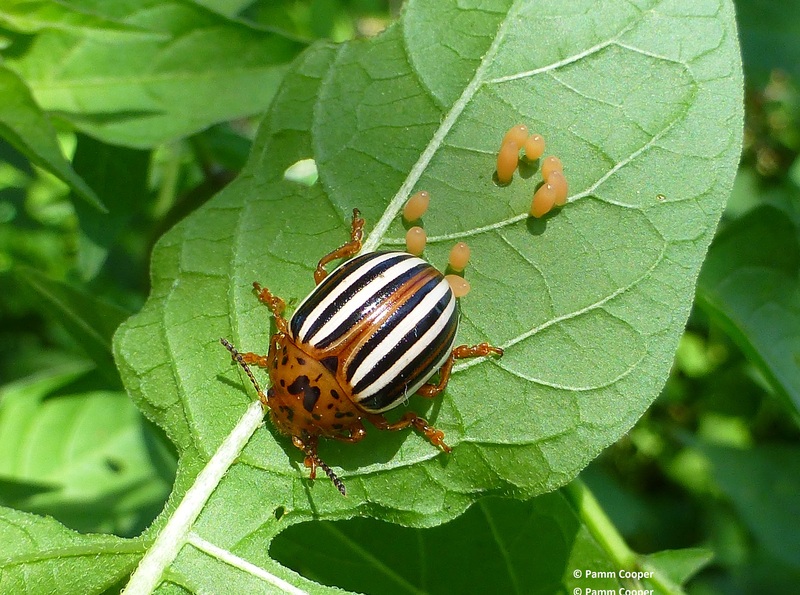 Be careful not to crush any lady beetle eggs, though, as the larva will feed on those of the potato beetles. 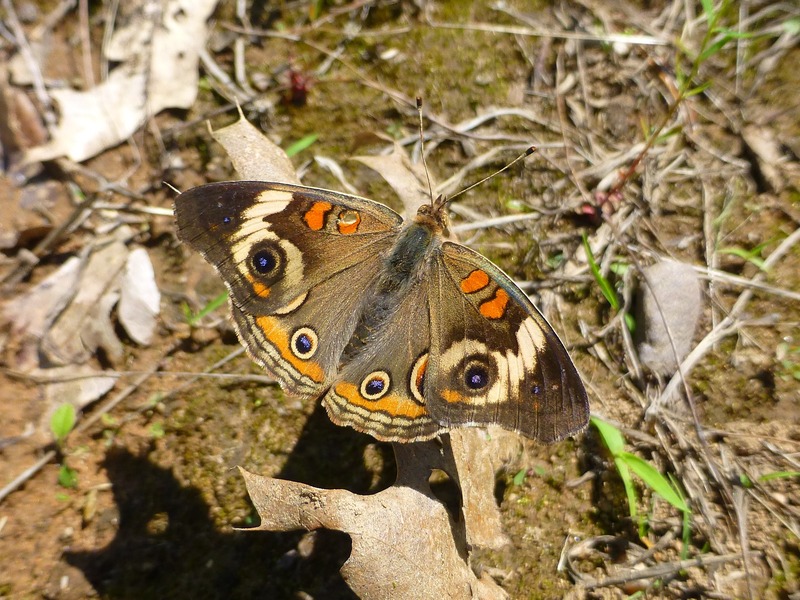 On a walk along a power line yesterday, I was delighted to see two visitors from the south- common buckeye butterflies. I have not seen these occasional visitors since Hurricane Sandy, so this a good butterfly to keep on the look-out for. Red- spotted purple, viceroys and American lady butterflies should be in the process of laying eggs now, if they haven’t already. I found several tiny spicebush swallowtail caterpillars also this week. Check out your dill, fennel or parsley, because the black swallowtail butterfly may have laid an egg or two on them, and the caterpillars may have hatched out. Swamp milkweed leaf beetles are easy to spot with their red and black elytra. Not pests, these chunky beetles are just a colorful splash on a green background. Pine sawyers, longhorn beetles commonly mistaken for the invasive Asian long-horned beetle, are active now. 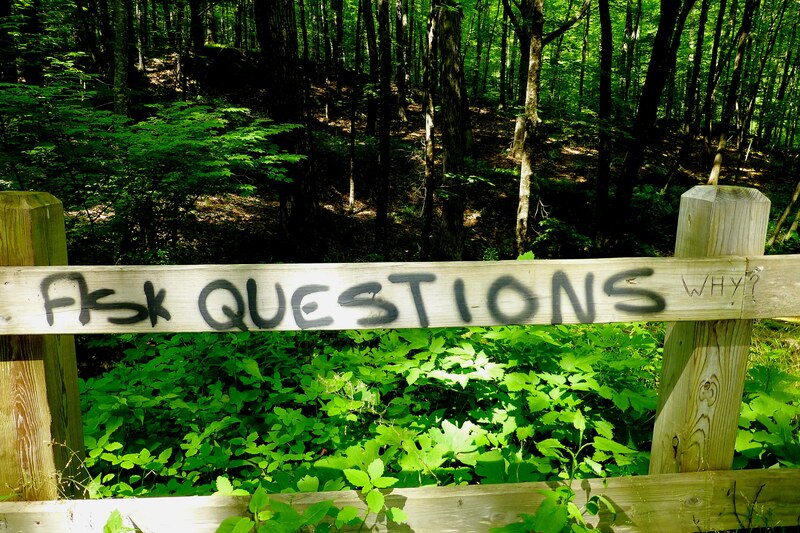 They will often visit newly stained decks until the stain dries out. 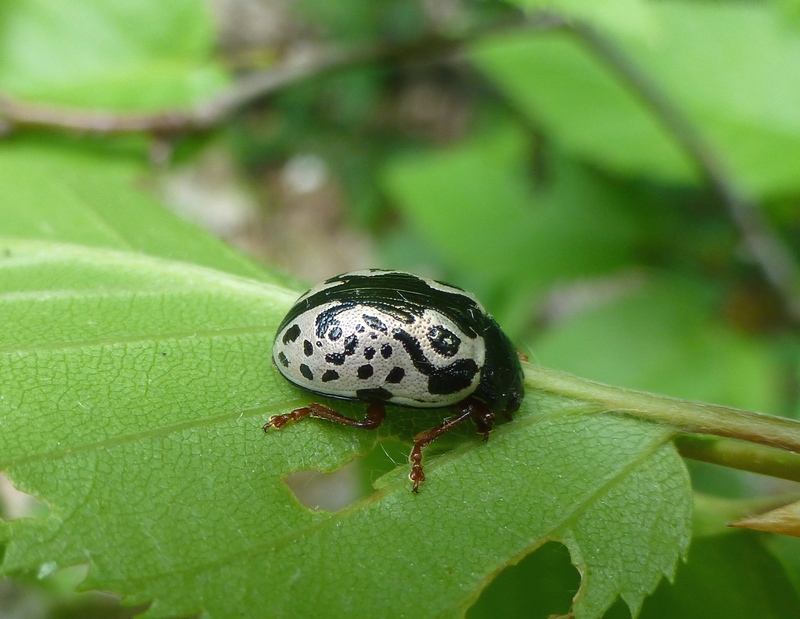 Dogwood calligrapha beetles, striking in their spiffy black markings on a white background, are out and about on native dogwoods now. There are many birds that are now fluttering around trying to keep up with newly fledged young. 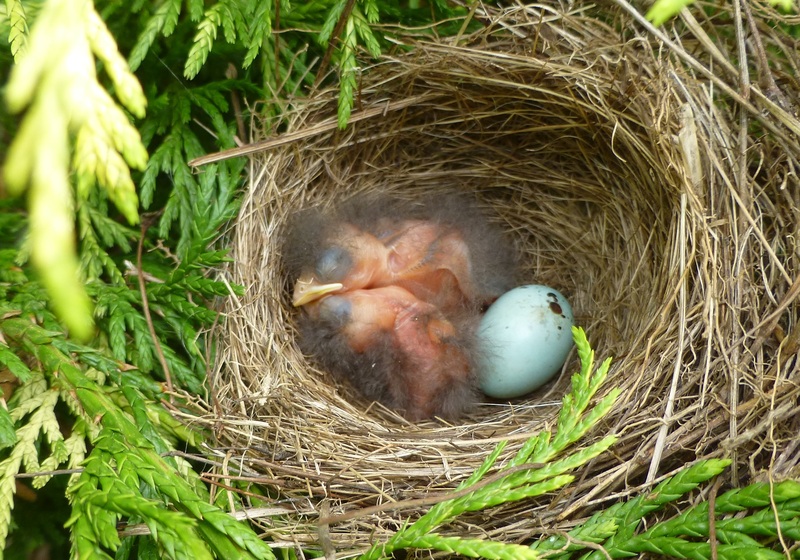 Catbirds, robins, red-tailed hawks, Carolina and house wrens, Bob-o-links and some sparrows have a clutch early and some species, like the ubiquitous robins have a second brood. Fledglings are often very loud as they beg for food, and get louder still as mothers withhold food briefly, to teach them how to fend for themselves. we recently had a visitor to our office. 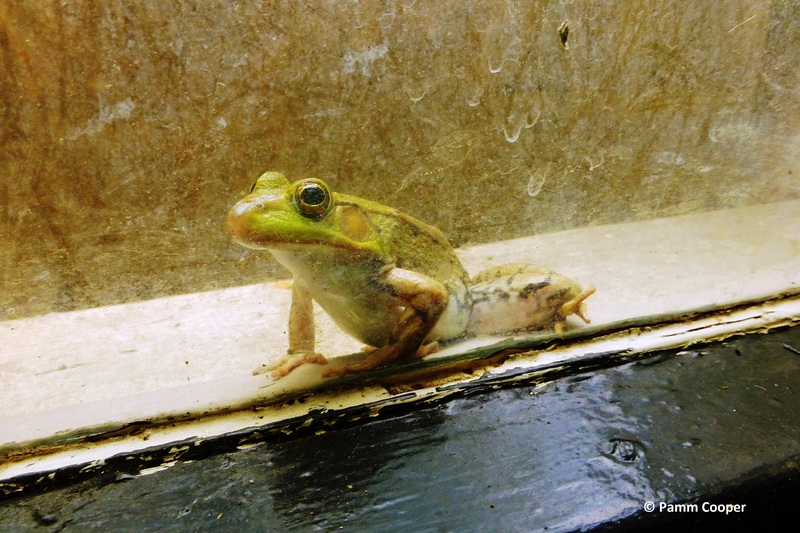 A green bullfrog somehow landed in our window well and could not escape. So we managed to catch it and Joan Allen walked it to a nearby pond. Another bit of excitement at work.